The Puzzled Palate and Just Another Mom are working together again to bring you another amazing giveaway that is perfect for the kiddos! My daughter is a visual learner. Like most kids on the spectrum, M does better with a set routine. I love the Good Night, Sleep Tight Reward Chart by Victoria Chart Company for that reason! If you have a kiddo that would benefit from a visual aid- check them out and enter our giveaway! 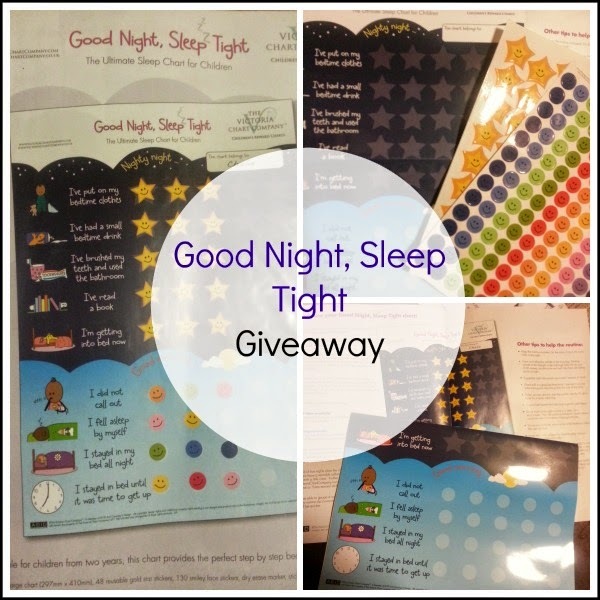 The honor award winner of National Parenting Publication Awards 2013, the Good Night, Sleep Tight reward chart creates the perfect bedtime routine for children. It provides a step by step routine with tips and guidelines to help set your kiddos up for a healthy night of sleep. Gold star stickers reward the pre-bedtime routine such as putting on pajamas, brushing teeth, reading a bedtime book and getting into bed. In the morning smiley face reward stickers acknowledge the child's successful accomplishments from the night before, such as staying in their own bed, not calling out and falling asleep naturally. • Sticky mounting pads for the wall. You can even download a FREE printable Sleep Certificate once for your child! *All of the stickers contain a repositionable adhesive-making the stickers reusable when positioned on the chart. The charts do not work on their own, parent or caregiver involvement is key to their success. As children feel good about their progress they will want to repeat their positive actions. * Disclaimer- Participating bloggers are not responsible for delivery of the prize. Just Another Mom did receive a complimentary product to facilitate this giveaway. The Puzzled Palate and other participating bloggers were not compensated in any way. The one I tried was awesome! It took a few tries to figure out positioning, but then it was super easy to use, and accurate. I hope the CDC isn't using these LOL! But seriously, this is good information. Red keeps thinking that it's time to get up around 4-5am. And screams to lay in our bed.... #nope. I'm wondering if this would help him, or a clock that actually said when it was time to get up! I got a behind the ear thermometer that did the same thing... awful. Now we have an across the forehead TOUCHING one and it does much better. But you still can't beat the in the mouth, under the tounge! This cracked me up! $60 toy to allow a kid to have their temp taken! I've had terrible luck with the thermal ones too. The only one that seems to work is the one the pediatrician has in his office. Thanks for sharing your thoughts. I have looked at these before and bought a low end one that was so so. Apparently it's just a flaw of the no touches. I'm going to stay traditional. Well...only $30 more:) But I am sure that they have better ones than this! I tried and tried. No such luck. I am glad yours worked!